Another Alvarez family tradition is the unusual edibles that fill our stockings on Christmas morning. Santa knows this family are adventurous eaters, and tries to outdo himself each year by surprising us with peculiar treats. In the past, he’s been known to shock the family with delectable gifts like boiled silk worm larvae, pickled bean curd, cans of mystery meat, and baluts—a partially-developed duck embryo which is boiled and eaten right from the shell (It’s beginning to feel a lot like Christmas!). Usually, these exotic delicacies come from places like China, Vietnam, and Korea and the labels are unreadable, making this tradition even more interesting. Thankfully, Santa knows that The Husbands are vegetarians and gifts us accordingly, because during lunch on Christmas, we feast on this strange spread of stocking stuffers. The worst was last year when Mr. Claus thought it would be amusing to introduce us all to surströmming, a fermented Baltic Sea herring contained in a bulging tin can that hisses when you open it, with an aroma that makes sewage smell like perfume. We’re sure the North Pole team got quite the giggle as we all covered our noses and mouths, trying to keep ourselves from gagging as we opened up the offensive can outside on the porch, of course. It was absolutely horrid at the time—it is literally the worst-smelling food in the world—but we can laugh about it now. We took our time on the drive down the west coast. Surrounded by forests of tall trees and running rivers along the highway, the scenic views from Portland to San Francisco are breathtaking. As we approached the top of California, we were greeted with dramatic views of Mount Shasta. This picture-perfect mountain towering over 14,000 feet was blanketed in winter snow, and made a striking backdrop to the quaint town where we stopped for a Mediterranean lunch. That first day, we drove an impressive ten hours to Sacramento, and booked a quiet room just a few blocks from the state capital. We were tired from the long drive, but there was just enough energy in our reserve tanks for a quick stroll around the grounds of the historic capital building, all decorated with twinkling lights for the holidays, followed by a round of cocktails at one of the local bars. After a light snack and one or two or three vodka martinis, our eyes grew heavy and it was time to hit the hay. We had a wonderful trip, love being away and traveling, but also like coming home to Eagle Rock, sleeping in our beds, cooking in our kitchen, and spending time with our kitty, Sylvia. Today we are sharing a simple recipe. With just four ingredients and an easy-peasy-super-breezy prep, it is a quick appetizer for a weeknight dinner yet elegant enough to serve at a fancy gathering. We partnered with Dagoba, an Oregon-based company that specializes in making organic chocolates with a variety of interesting flavors. 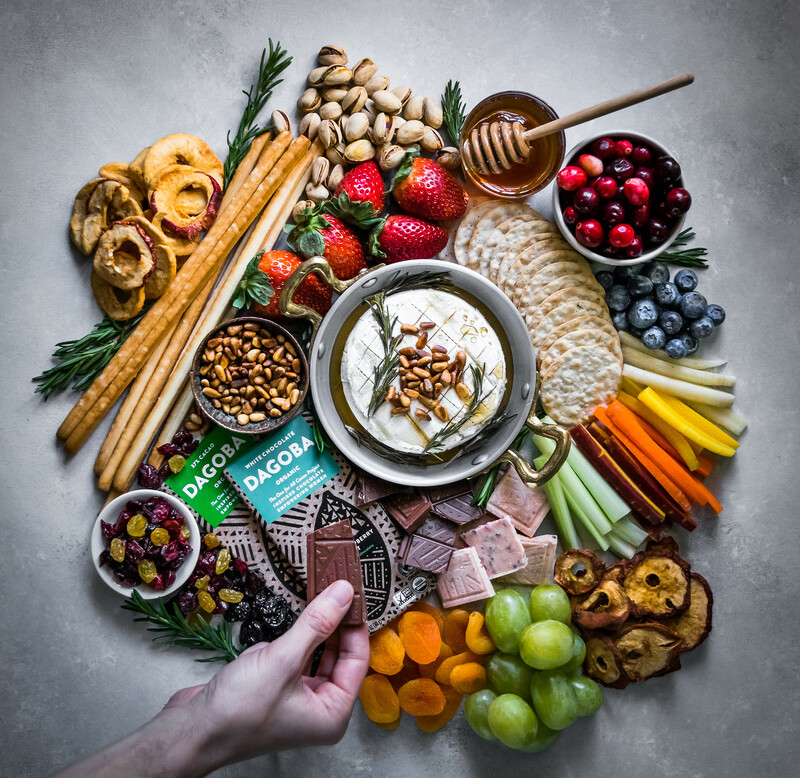 Last month we paired their chocolate with a sparkling winter sangria, and today we came up with another match made in heaven: baked brie with honey and toasted pine nuts. 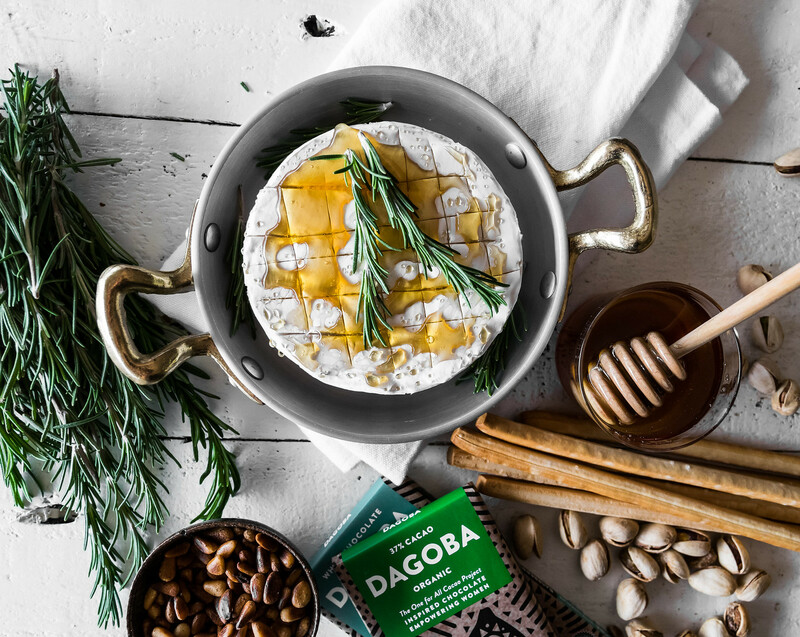 You’ll find us hovering possessively over the baked brie at any party we’re invited to, but we have never tried making it ourselves. Until now. 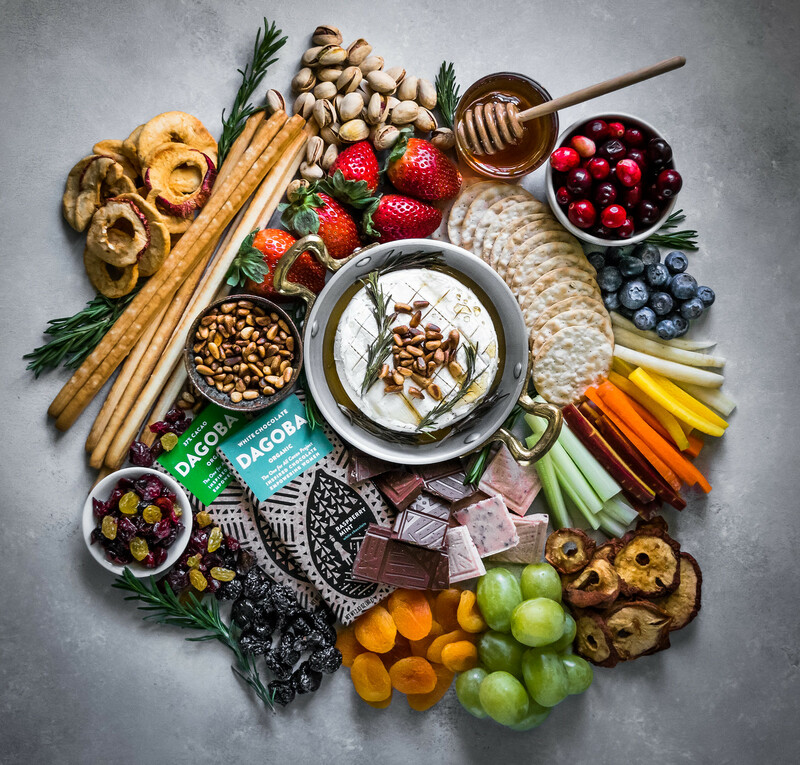 There are endless ways you can dress up this soft and creamy cheese: top it with dried fruits like cranberries and raisins, sprinkle it with your favorite nuts like pecans or walnuts, sauté it with fresh apples, pears or strawberries, or try spreading it with a dollop of raspberry jam or orange marmalade. You can even wrap a wheel of brie in a flaky puff pastry to make an attractive starter that is golden and delicious. 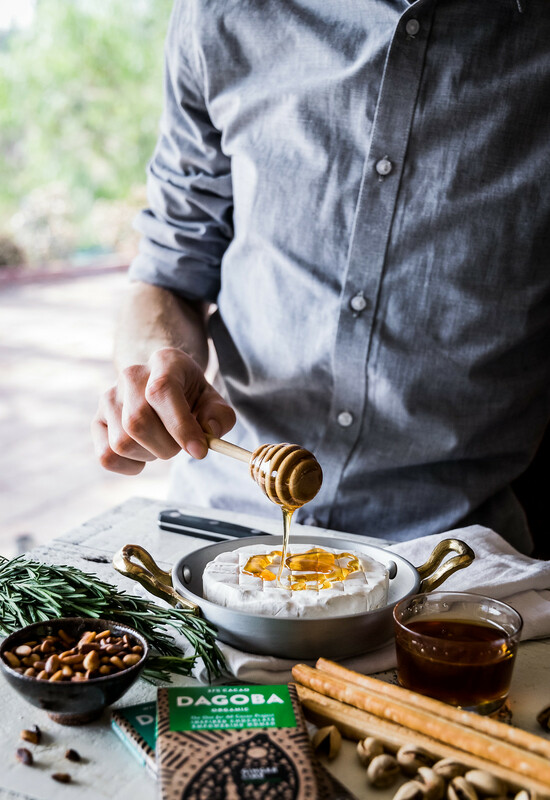 The recipe we came up with today simply uses fresh rosemary, a drizzle of honey, and toasted pine nuts, baked until ooey, gooey, and irresistibly tasty. It pairs perfectly with Dagoba’s bold Ginger Lime and Raspberry Mint chocolate bars, and when you include it in a decorative party platter alongside colorful items like rainbow carrots, crackers, raisins, fresh berries, and breadsticks, it makes a vibrant display which will act like a food-magnet at your next party. Sourced only from small cacao farms, Dagoba chocolate makes unique flavors that are thoughtful and complex. These special varieties are only available at Target stores, so start planning your next soirée and tag #husbandsthatcook when you post pictures of your pretty party platters. Cheers to chocolate and cheese and to the new year! Preheat oven to 350°F/177°C. Remove the cheese from all of its packaging, and place in an oven-safe serving vessel such as a small skillet or baking dish. Lightly score the top with the tip of a sharp knife, making a crisscross pattern. Drizzle 2 tablespoons of honey over the cheese, and lay a few sprigs of rosemary on top. Bake for 12 to 15 minutes, until the cheese is soft, but not melted. 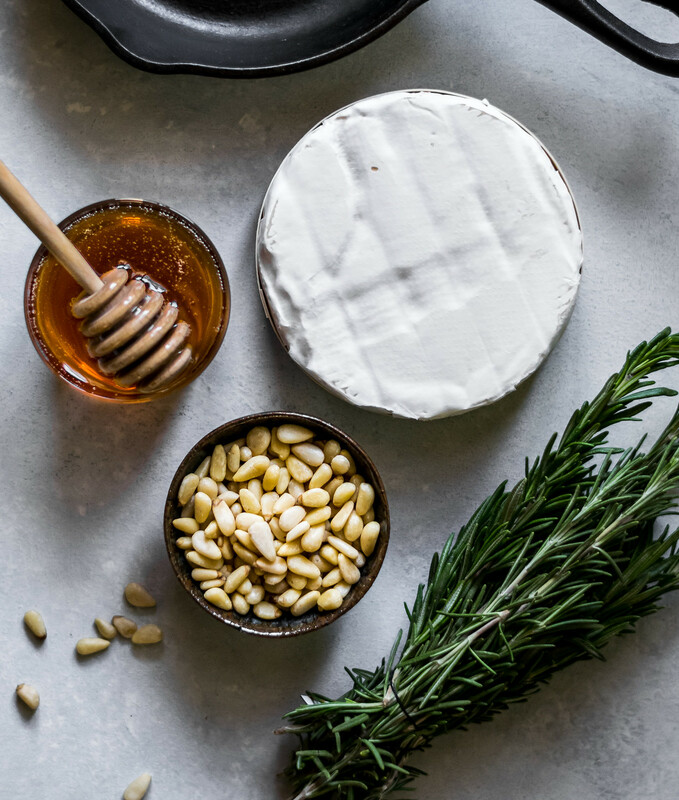 While the Brie is baking, place the pine nuts in a small dry skillet. Set over medium heat and stir occasionally until the nuts are deeply toasted and fragrant, 5 to 7 minutes. Transfer them immediately to a plate or bowl to prevent them from overcooking. When the Brie is done, drizzle the remaining tablespoon of honey over the top, and let cool for 2 to 3 minutes. 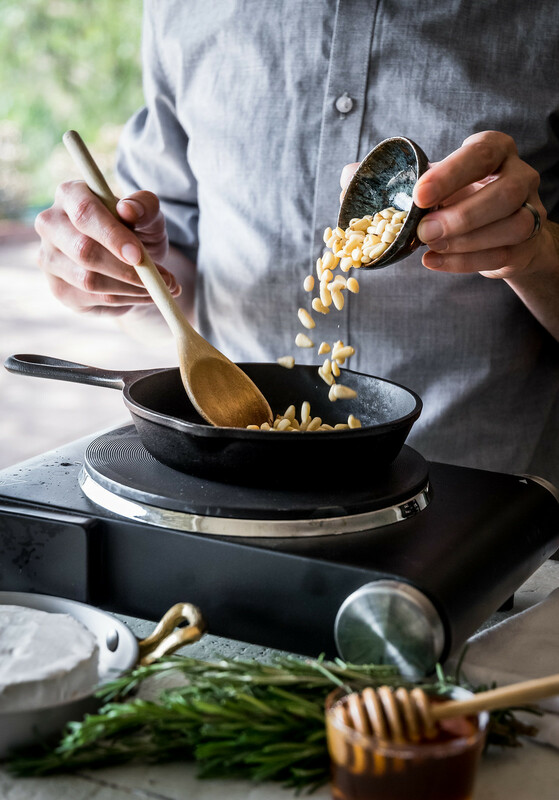 Top with the toasted pine nuts, serve warm, and enjoy! Hi, guys! Happy New Year! This recipe sounds wonderful! I’ve made it with jam and puff pastry and YUM! Next time I’m gonna give your recipe a go! Enjoyed hearing about the interesting foods you receive in your Christmas stockings! You are more brave than I am, that’s for sure. Have you tried bone marrow on toast or crackers? I hear it’s a lot like butter. Hmmmm. I think that’s about as adventurous as I will ever be. Haha our Christmas traditions are probably pretty strange, but they’re fun too! Since we’re both vegetarian, it’s an easy excuse to get out of trying some of the more… extreme foods, haha. So we haven’t tried marrow, but we hear that people love it! I love baked brie and this is so gorgeous! We do toooo! 🧀💕 Thanks so much Laura, and happy new year!! So simple, and sooo tasty! Thanks so much Sherry! If you try the recipe, definitely let us know how it turns out! It looks good, and I’m sure it tastes even better, but I didn’t understand completely what tools have you used to cook it (mixer, baking dish, whisk, etc)? I’ll be very grateful for respond. Hi Katryn, the full recipe with all the directions is printed above! If you have a specific question, let us know!